Errr. So I know it’s the week of the world’s major gadget fair, CES 2011… but, we just thought we should take some time out to tell you about important scientific research done on cats. 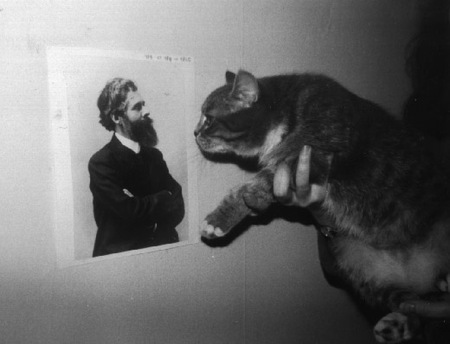 The blog Improbable Research (an off-shoot of the Annals of Improbable Research and done by the same people behind the Ig-Nobel prize) reports that research was carried on how cats reacted to men with beards. 1. Cats do not like men with long beards, especially long dark beards. 2. Cats are indifferent to men with shorter beards. 3. Cats are confused and/or disturbed by men with beards that are incomplete (e.g., Bork) and to a lesser degree by men whose beards have missing parts (e.g., Crafts). This sets my spoof bells a-ringing, but it’s a cracking read, and until I hear some cold hard scientific evidence to the contrary about the behaviour of cats around beards, I’m going to believe it. Read the rest on Improbable Research. I don’t know why, but this sentence just won’t stop cracking me up, more so than even the rest of the story. Possibly because it’s so vague about how they actually did die, possibly because of the immediate reassurance that bearded do not inexplicably cause cat deaths.